The #1 multi-tenancy backup and recovery solution for VMware vSphere virtual machines. Designed by administrators for administrators, it is easy to use and allows you and your tenants to backup and restore files with just a few clicks. VMcom Backup Appliance is a pre-installed virtual machine designed to back up and recover VMware Virtual Machines. Coming from an ISP background, the VMcom Backup Appliance is highly focused on multi-tenancy. It enables the central administrator to create isolated (tenant) environments within a single appliance. Each tenant then can be assigned a set of privileges for the backup and recovery of particular VMware vSphere objects and a storage quota. 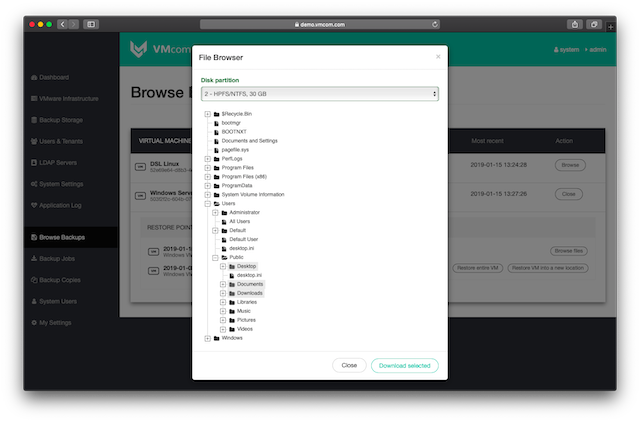 "VMcom brings a new level of backup experience both to our customers and internal DevOps team." "I love how our techs can now use one platform for both file level and machine level restore if needed. Fantastic." "Setting up VMcom, adding EMC data domain as storage device and scheduling the first backup job took us literally less then an hour." "We found the GUI to be very intuitive and easy to work with." "Very reliable backup tool. Intuitive and easy to use. And great post-sales experience with timely and professional support." To reduce IT workload, we have designed a backup solution with powerful multi-tenancy. 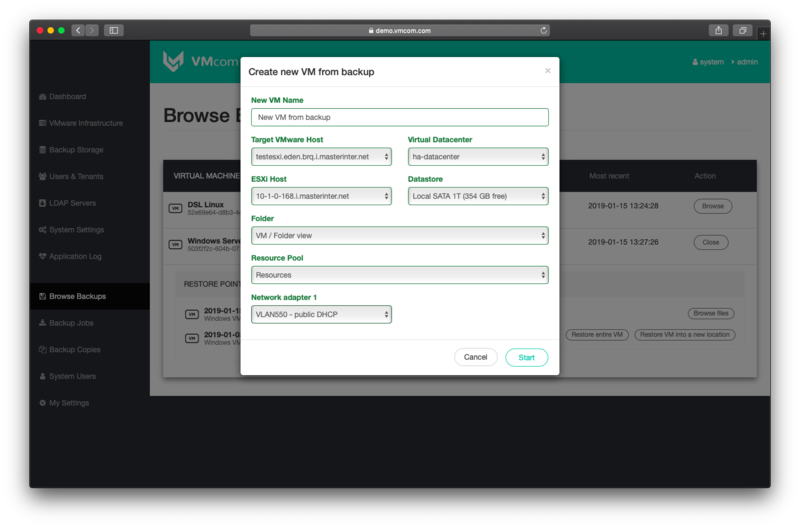 VMcom Backup Appliance enables self-service: backup plan management, on-demand ad-hoc backups, file-level restore for both Windows and Linux, and VM level restore. A modern web-based console for self-service backup and recovery included. 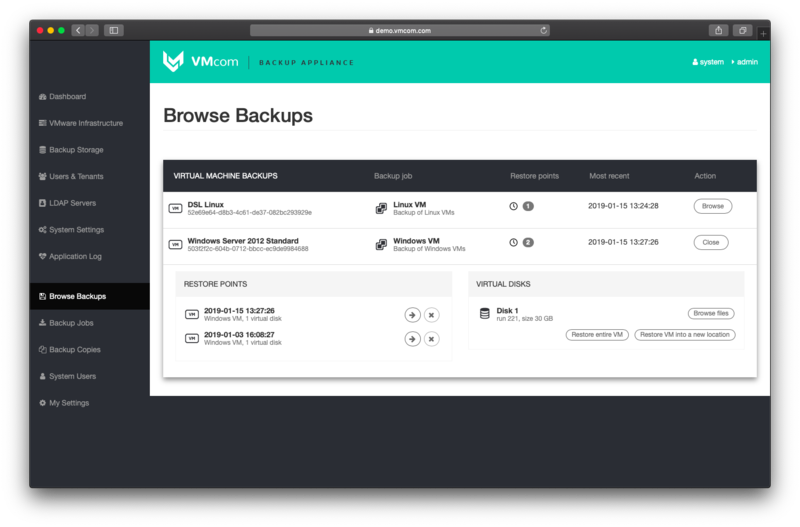 This modern and touch-friendly user interface is available for all functionalities of VMcom Backup Appliance, including backup plan management, on-demand backup, file level restore and so on. VMcom Backup Appliance leverages the VMware changed block tracking (CBT) technology and snapshots. This approach allows for fast and differential backups, saving only blocks changed since the last backup. VMcom Backup Appliance provides a solution for an unlimited number of tenants. Administrators are able to control tenants’ storage quotas and granular permission settings. With no agents to deploy in the guest operating system, you get both flexibility and reliability for backup and recovery of your VMs. We have chosen a linux-based solution with a built-in database and tools. No third party components such as SQL servers are required. Thanks to automated usage reporting, dealing with licensing does not have to cause a headache anymore. Deployment from OVF template is fast and easy and does not take more than 15 minutes. Building a proof-of-concept environment has never been easier. Protect your VMware with VMcom. Multi-tenancy is unique to VMcom Backup solution. As a master administrator, you can see all backups of all existing tenants while tenant users can only see and manage specific parts of your inventory. This allows for unprecedented levels of self-service for virtual machine operators and saves valuable time of your core administrators. VMcom handles file-level restores from both Windows and Linux filesystems natively. Browse your backups in the same way you know from your computer. You can even download older versions of your files with zero disruption to your virtual machine. No indexing required. You'll find that incredibly fast and easy to use. Let VMcom handle the difficult part for you. Create a new virtual machine from an existing backup while the original is still running. You can even restore to a different vCenter or ESXi host. Create a test environment for your application in a few clicks or check the integrity of your backups with zero disruption to your primary workload.